This is a free crochet chart for people who are interested in making a filet crochet dragonfly design. It can also be adapted to different types of crochet and other crafts. The size is variable, allowing this design to be useful for making a variety of different types of projects. In addition to filet crochet, this chart could be used to cross stitch the dragonfly design on a crocheted single crochet or afghan stitch background. 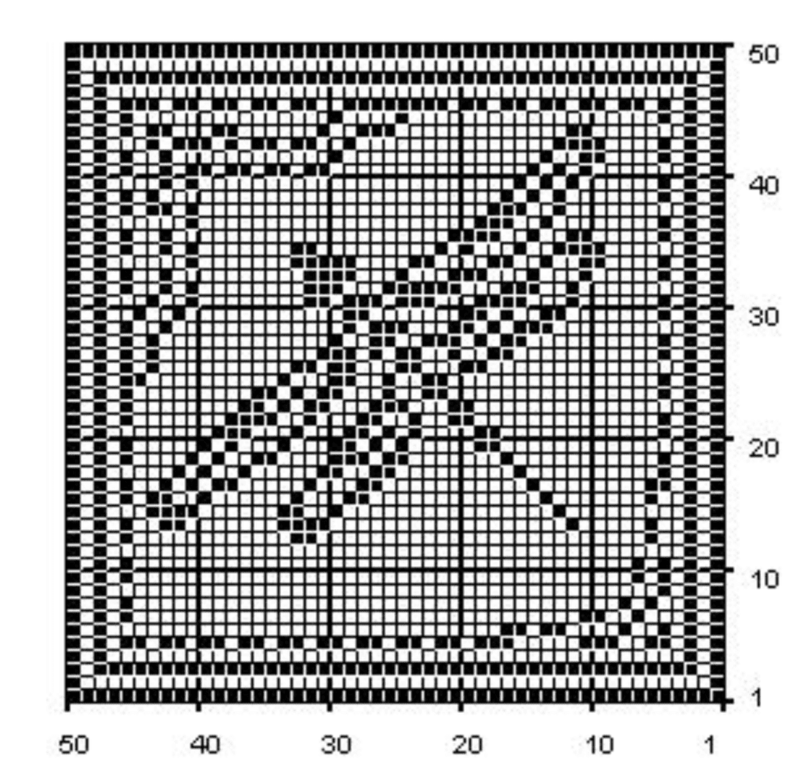 People who know how to read charts for tapestry crochet or pixel crochet will also be able to adapt this pattern to those techniques. It works for any graph-based design. Once you have learned how to do filet crochet, whether you choose to use the 3 dc or 4 dc technique, it is not necessary to have additional written instructions to complete the crochet pattern. You use the same technique for all filet crochet and only need the graph. Learn how to filet crochet here. The photo attached is the graph for this pattern; the chart itself IS the free pattern. This crochet square can be used to make a wide variety of different projects. The chart is designed as a 50 stitch by 50 stitch square. The actual size of the square will vary greatly depending on the crochet thread or yarn size selected and the corresponding crochet hook size used to work the pattern. The square may be a small thread crochet square used as a coaster or a large bulky-weight crochet square used as a blanket ... or it may be any size in between. One terrific option is to make this square in multiple solid colors and stitch them together to make an oversized scarf or an afghan. Of course, people who simply love the dragonfly design may want to make the square and hang it as wall art just like it is. There are many options for filet crochet squares once you know how to make them. The dragonfly is a beautiful design that you might wish to crochet simply for aesthetic reasons. But for some people, it is also a design with symbolic meaning. Similar to butterflies, the dragonfly is associated with transformation.Dragonflies are associated with water and are said to be symbolic of going "below the surface" or getting to a place of deeper meaning in life. People who are going through periods of transition, particular in terms of psychological and emotional growth, may find the dragonfly to be a helpful symbol for getting through to the other side. Although it is about transition, the dragonfly is also said to be symbolic of being in the moment, so people who are practicing that may also find symbolic meaning in crocheting dragonfly designs and for that reason it can be terrific for mindfulness crochet.